Greet rosy-cheeked guests with a showstopping holiday wreath featuring old Saint Nick. 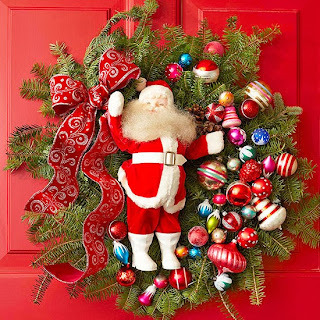 Bright assorted glass ornaments add playful pops of color to the wreath, while a large red ribbon makes a bold statement. To make, simply hot-glue the materials onto a store-bought evergreen wreath, then display for all to see. Welcome Christmas guests to your table with Santa-hat place cards. 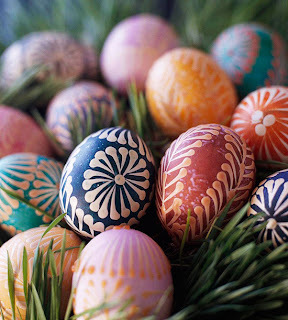 All you need to make them is tracing paper, glitter felt, glue, pins, and a gold jingle bell. The glittery fur-trim hats also make great party favors. Wave a flag for Santa's favorite season. 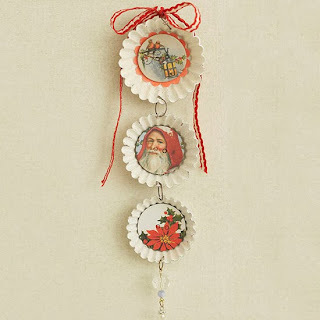 Reuse Christmas cards featuring the jolly old elf's image in a festive banner. 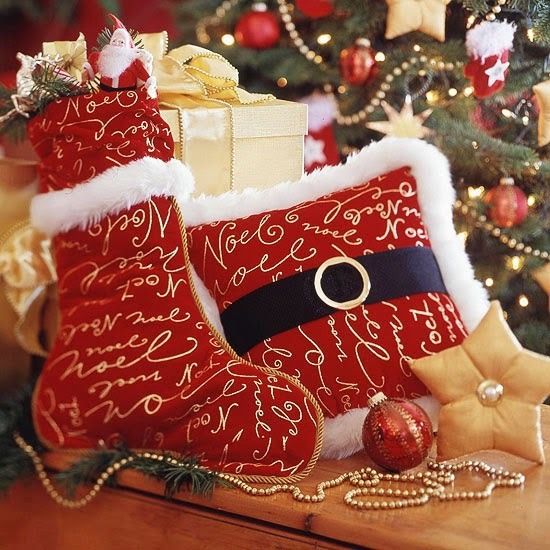 Choose a single Santa image or string different depictions for an eclectic view of the season's familiar gift giver. 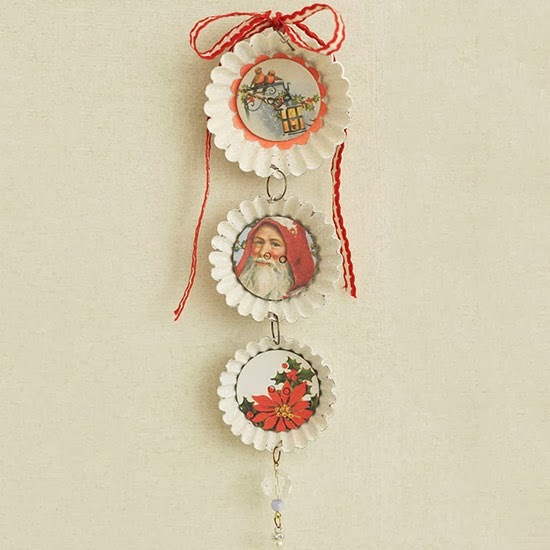 Add printed or handwritten sentiments between ribbon-hung Santas for a banner that expresses your personal holiday perspective. 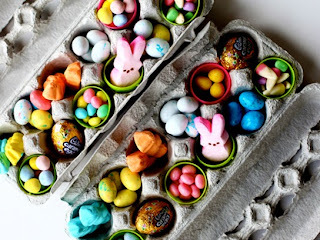 Tiny tart tins make the leap from cookware to cheery Santa-theme wall decor. Painted, glittered, and joined with metal jump rings, the three tins earn festive status with holiday chipboard centers. 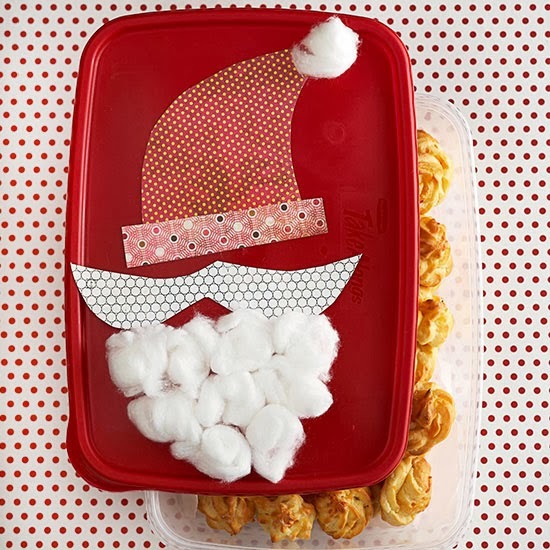 Store your holiday goodies in a festive Santa Claus container. Cut scrapbooking paper into the following shapes: a mustache, a hatband, and a Santa hat. Adhere the cutouts to the top of a large flat plastic container using a glue stick. Using crafts glue, attach a cotton ball to the tip of the hat and a group of cotton balls underneath the mustache to create a beard. 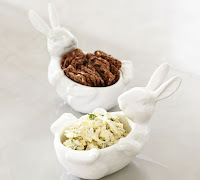 Fill the container with cheese puffs or another favorite Christmas snack. 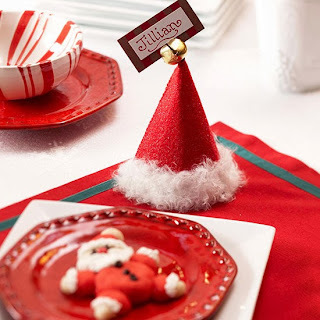 Giving your home Santa-inspired flair is simple. Just add a black ribbon and an O-ring belt buckle to a pillow to create the look of Santa's belt. We used this glitzy holiday pillow, but a plain red pillow would work well, too. Thread the ribbon through the buckle and sew the ends into the seams of the pillow. Sew white fluffy trim (available at fabrics stores) around the edges for a festive Santa Claus craft. What you'll need: Two chipboard stars (one big, one litte), glitter scrapbook paper, sheet music, a Santa face, glue, a red ink, and scissors. This shimmering chipboard star will add a vintage vibe to your Christmas decor. To make, first trace the big chipboard star onto glitter scrapbook paper, cut out, and glue onto the chipboard star. 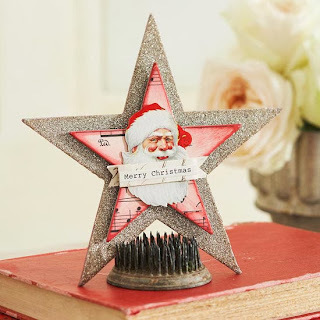 Trace the little star onto sheet music, cut out, and glue to chipboard star. Ink the edges of the star and blend towards the center. Let dry. Adhere the little star to the big star using adhesive dots. Next, glue a Santa face onto the little star. 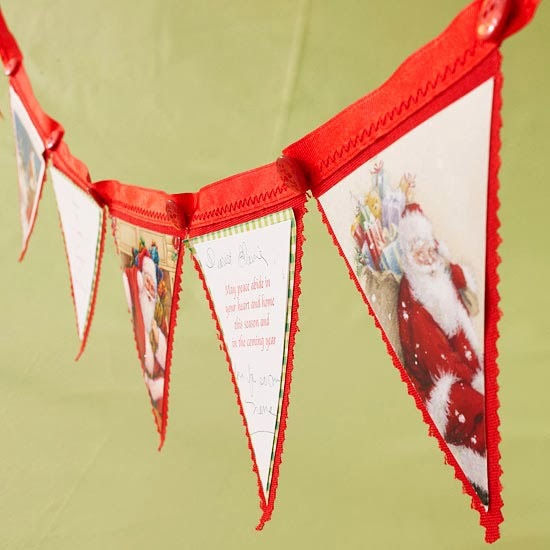 Once dry, glue a banner-shape cut from scrapbook paper across Santa's beard. 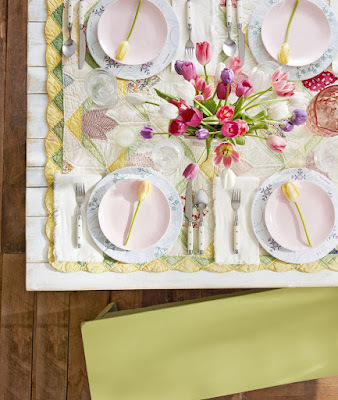 Add a cheery holiday sentiment to the banner.